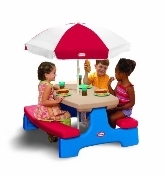 Our picnic table is great for indoor or outdoor use, for extra seating or a roomy place to play. Includes umbrella for shade. Seats up to 4 children. Colors and styles may vary.